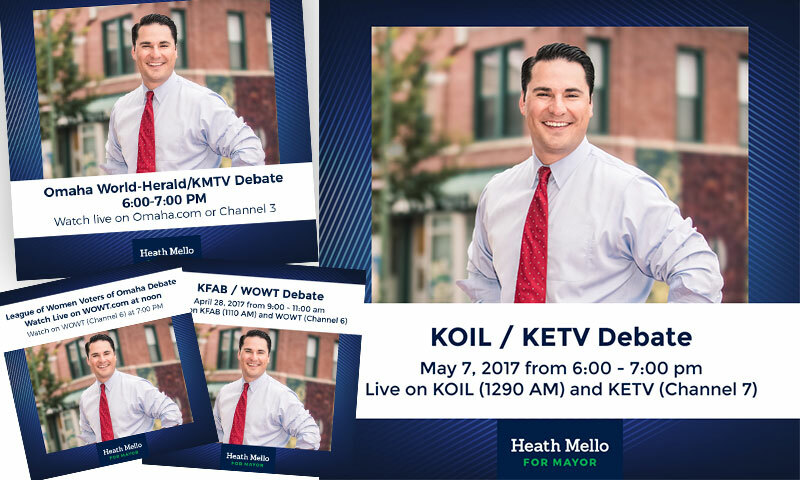 Bright-eyed and ambitious: two things we had in common with Omaha mayoral candidate Heath Mello. 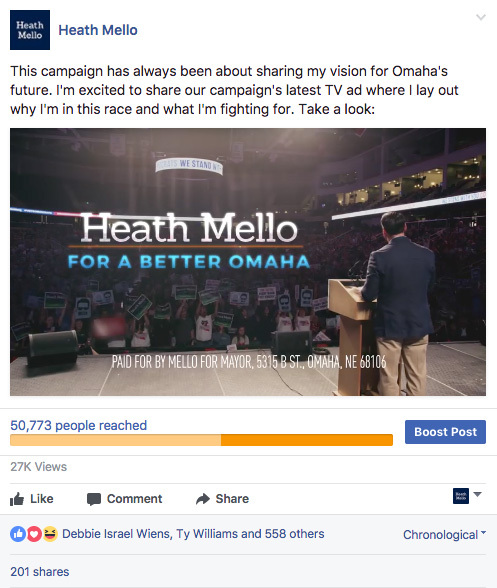 As members of Heath’s team, we helped deploy his campaign message from the initial announcement to election day nearly a year later. 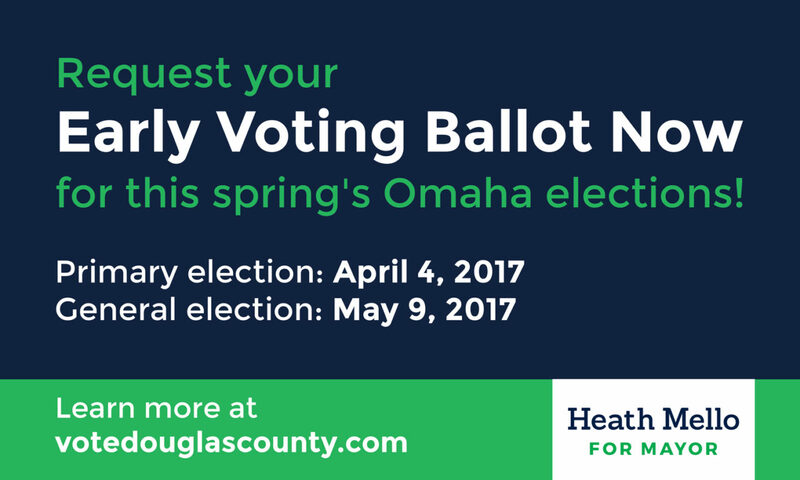 We met each step of the race with an integrated, proactive strategy that engaged Heath’s supporters and brought people together. 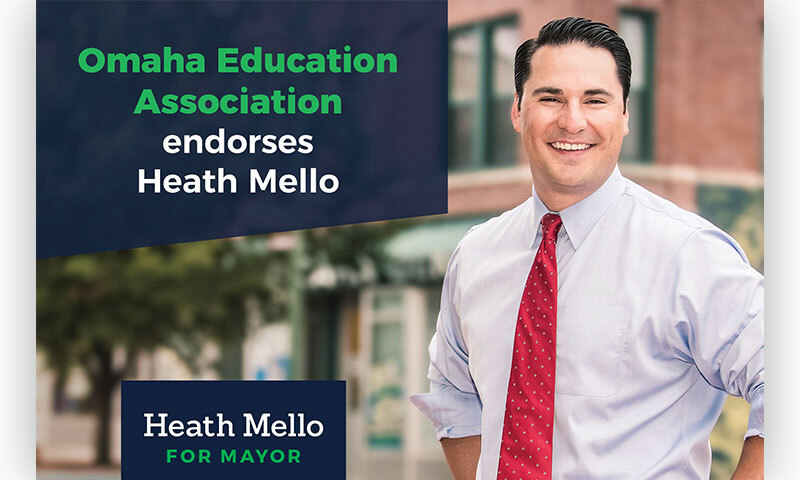 As part of Team Mello, we had the pleasure of watching Heath’s campaign grow as it gained momentum. 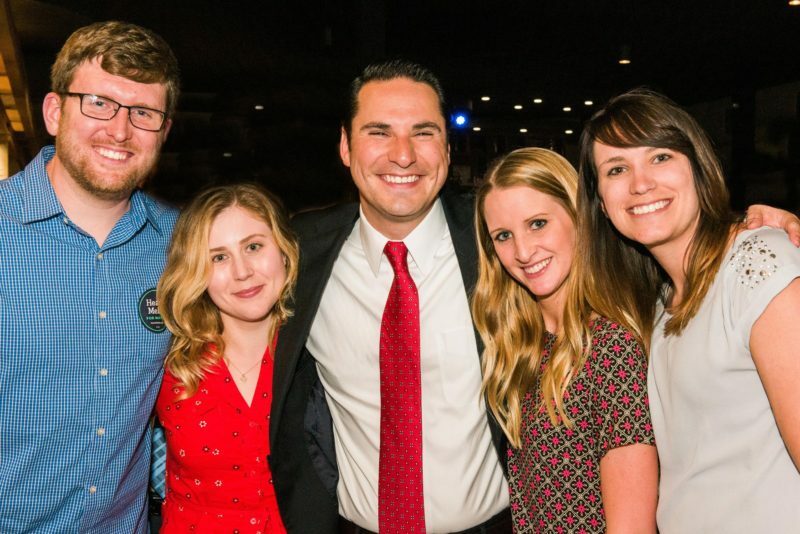 We helped deploy Heath’s message as he announced his bid for mayor, participated in his campaign kickoff event, and strategized his online presence. With each step of the campaign, we adjusted deliverables accordingly as we neared the May 9, 2017 general election. 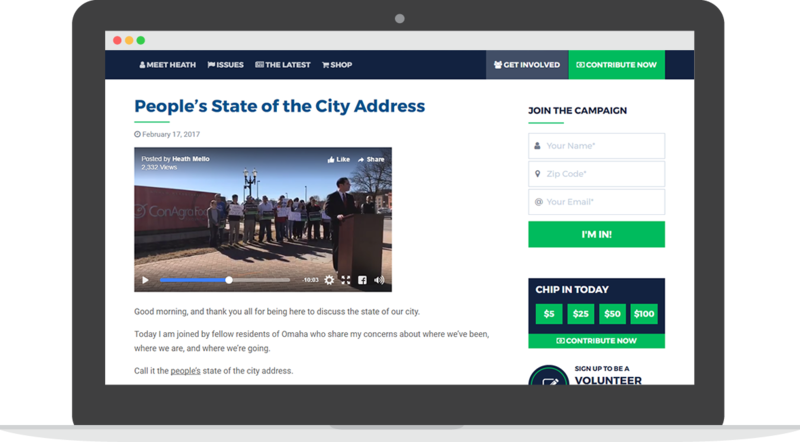 Our first task was to build a website, donation platform, and a consistent social media strategy that matched the already established campaign brand and image. Creating graphics and social posts that mirrored the design and language of the website was an ongoing project for our team. 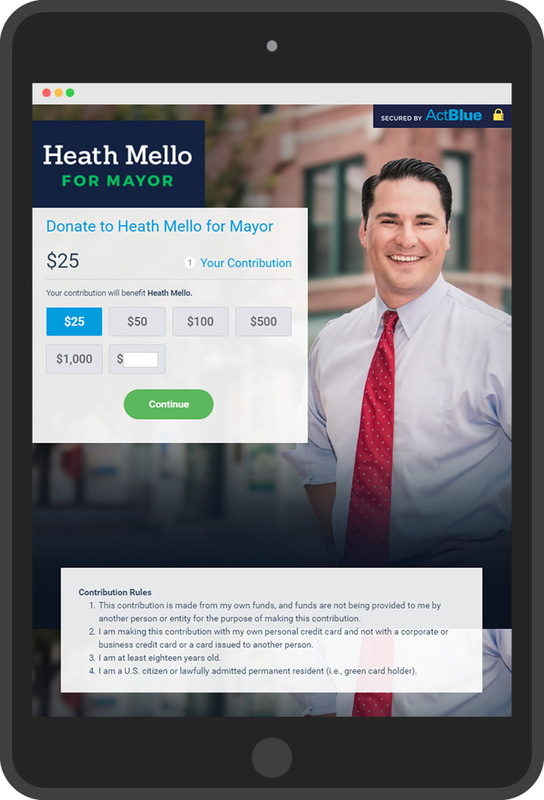 The website was designed to be hub for all election related information and Heath’s platforms and plans, as well as a place for supporters to learn about volunteer opportunities. Later, the Mello for Mayor website built by the BCom Team was recognized as a Pollie Award recipient. During the campaign, the Mello team kept supporters up to date on the latest campaign news. When links were shared directly, an internal news article page was the first page visitors would see. The sidebar was designed so that every page could act like a landing page. An embedded join form along with prompts to donate and volunteer added to overall user website engagement. Mobile optimization was a key component of the website design. Web forms and buttons were optimized to be easily filled out on a mobile device. 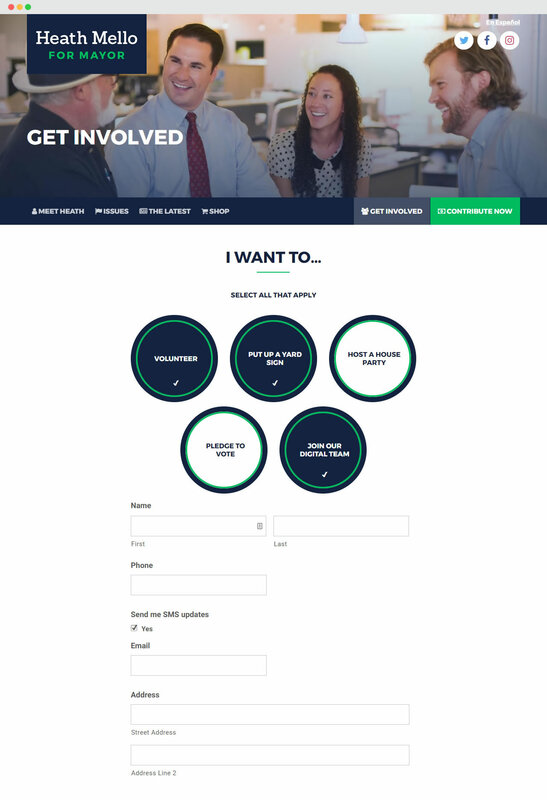 The main call to action buttons to “Get Involved” and “Contribute Now” became fixed to the bottom of the screen for easy access. 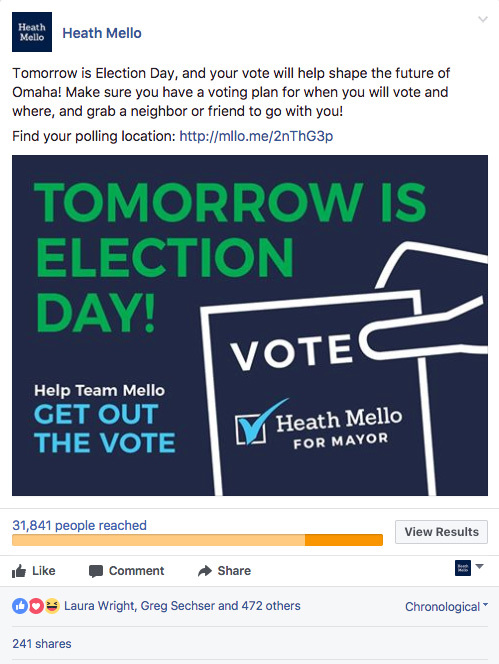 ActBlue was a third-party provider that helped the Mello Team to surpassed all previous fundraising records for an Omaha mayoral challenger. Donors were able to take advantage of ActBlue’s easy to use features which helped Heath gain the financial support needed to compete down the stretch. We recognized early on was that many of Heath’s supporters consisted of young, tech-savvy individuals who were willing to volunteer their time. We knew the best way these supporters could impact the campaign was by building a grassroots digital team. The goal of the team was to connect with constituents, share authentic branded content, and increase engagement online. 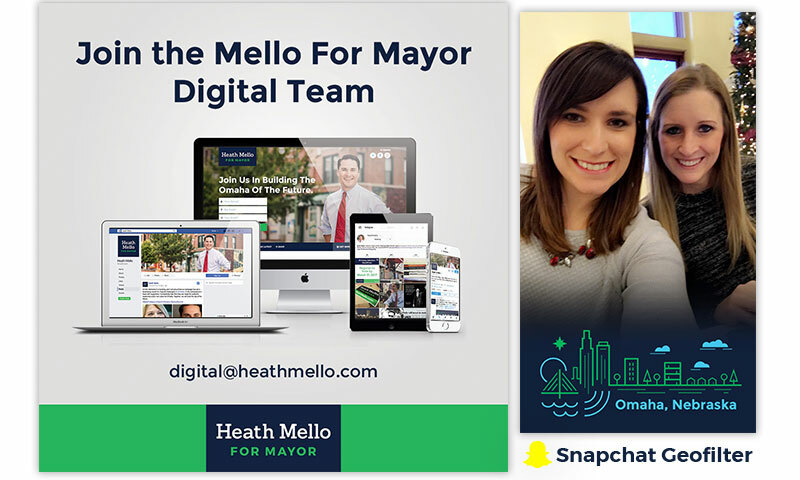 We provided the digital team members with the digital toolkit they needed to engage social followers and provide education about Heath Mello’s campaign. We had less than a month to prepare for the general election after the primaries in April. We continued to utilize the Mello digital team as advocates and a source to get out the necessary information, such as volunteer opportunities and voting information. Graphic design was a crucial part of the digital aspect of this campaign. 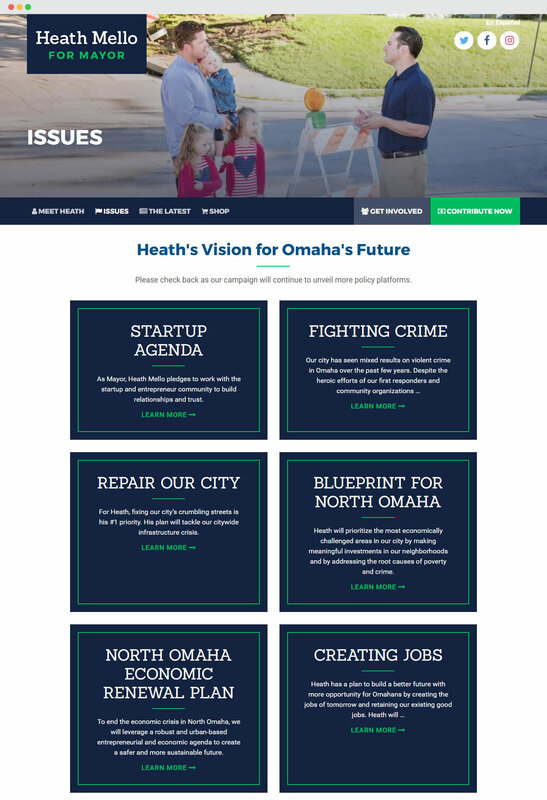 Adding visual elements to a campaign like Heath’s kept supporters and voters engaged and informed. Our design team created custom branded graphics for endorsements, events and fundraisers, volunteer opportunities, and special announcements. We shifted the focus of these graphics to highlight voting deadlines, polling locations, and simply getting out the vote leading up to the general election. 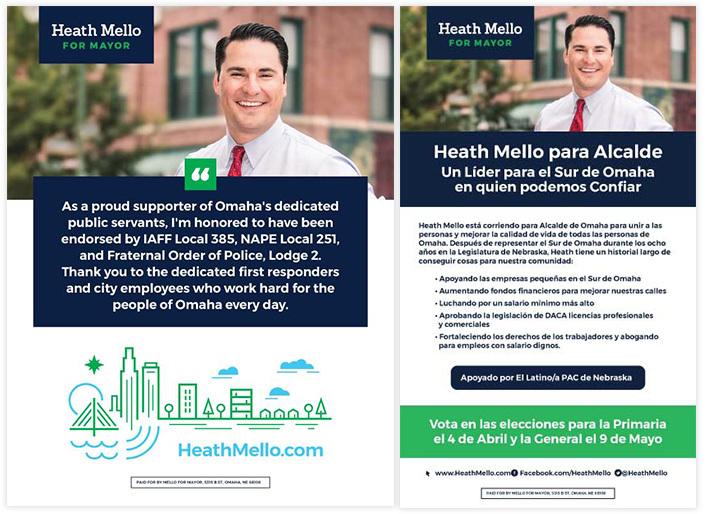 Above all, consistently branding Heath’s campaign and creating a unique style that was easily recognizable as Team Mello was key. As we deployed more posts, videos, and graphics across all social platforms, we created a carefully strategized ad plan. We deployed ads through Facebook to increase reach, drive supporters to Heath’s website, and encourage engagement. 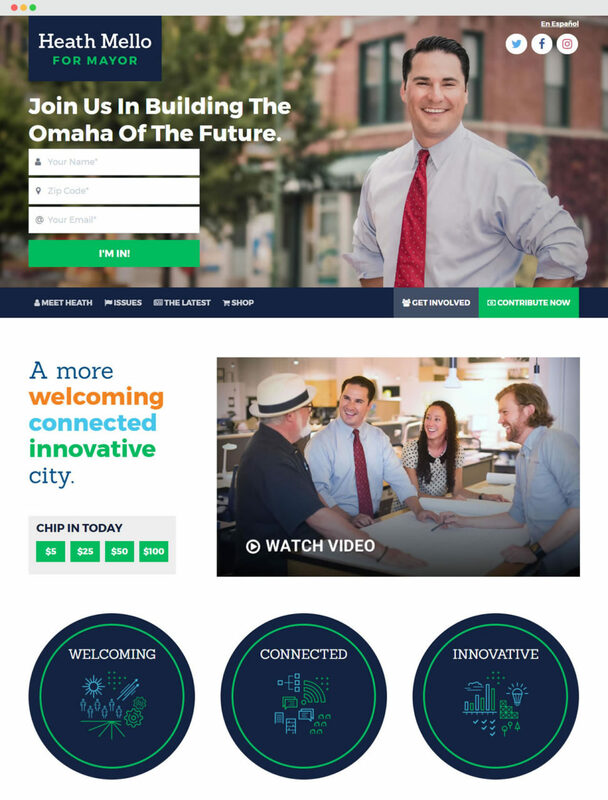 Our team built custom audiences to target constituents from across the city of Omaha. Some audiences included South Omaha residents only, some were just for people whose politics leaned left. Our custom audiences were built to reach different demographics who could find common ground in their support for Heath as mayor. Heath’s supporters hosted fundraising events throughout the duration of his campaign. 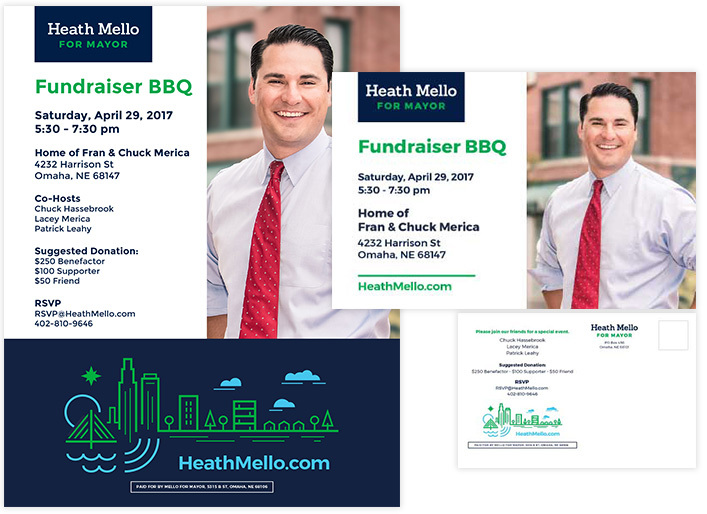 To supplement these events, we provided the Mello team with postcards, letter invites and weekly Facebook event graphics. We also created full page newspaper ads in both English and Spanish, for various newspapers in Omaha. 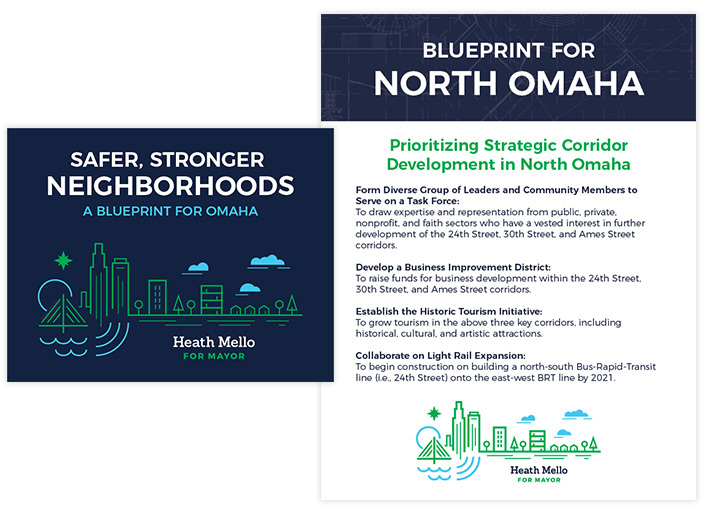 Heath introduced a series of blueprints highlighting his plans to improve Omaha during the last month of his campaign. To highlight his improvement plans, our team created individual print designs, as well as postcards and posters to promote events. 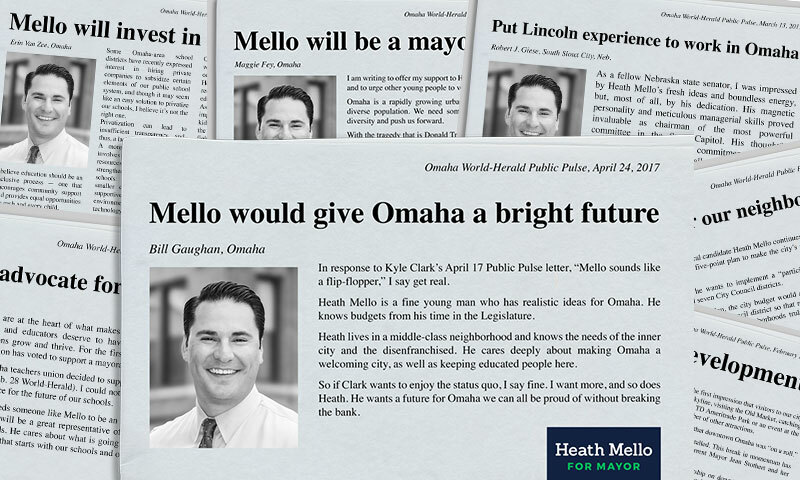 Thank you to Heath and the rest of Team Mello for letting us be a part of your campaign journey. We know he’s destined for great things and we can’t wait to work with him in the future! 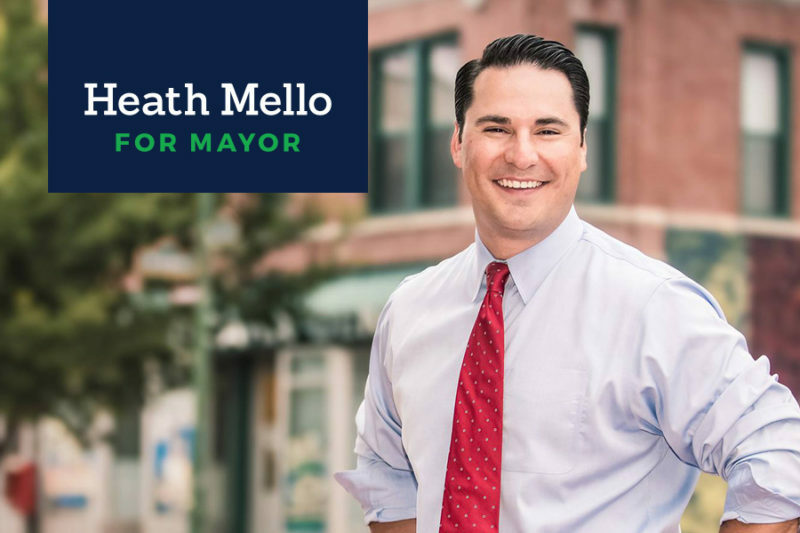 We had the pleasure of teaming up with many creative and talented partners throughout the Mello for Mayor campaign, including official campaign photography by Adam Casey and branding and illustrations by Justin Kemerling.